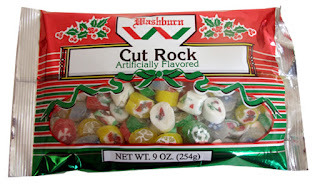 Cut rock Christmas candy is one of the oldest Christmas candies still available . Round chunks of fruit flavored candies with a festive design in the middle. If these don't make you think Christmas then nothing will. I am sure you remember these old time candies you ate as a kid at your grandma's or aunt's house many years ago. Buy cut rock candy and bring back some holiday memories of the past.